In the "SpongeBob SquarePants" episode called "Band Geeks", Squidward Tentacles receives a telephone call from his old high school band rival Squilliam Fancyson, who is living out Squidward's dreams of success. Squilliam says he was supposed to play at the big "Bubble Bowl" (a sports stadium) next week but cannot attend. Knowing Squidward has no band, he asks him if his "band" could perform in his absence. Squilliam then makes fun of Squidward's lack of success. Squidward, not wanting to admit that he works at a fast food restaurant, says that he does have a band and that they would be glad to play at the Bubble Bowl. Of course, Squidward has no band, so he posts fliers around Bikini Bottom for people to join his marching band in preparation for the Bubble Bowl. He attracts a large group of people, which consists of SpongeBob, Patrick, Plankton, Pearl, Mr. Krabs, Larry the Lobster, Mrs. Puff, Sandy, and many "SpongeBob SquarePants" characters. Things start off badly when Squidward finds out that nobody in the group knows how to play any instruments properly. Their rehearsals are very unproductive and out of control, and the Bubble Bowl is only days away. The band is very terrible and shows no signs of progress. The day before the Bubble Bowl, Squidward yells at the band for being terrible, which causes the band to turn on itself with their instruments, and a brawl starts bickering until practice is over. Then, they all calmly start to leave, feeling satisfied with themselves. Squidward sadly tells them not to show up tomorrow for the Bubble Bowl because of their lack of progress, however SpongeBob convinces the group that they should continue practicing, because they shouldn't disappoint Squidward. The next day, Squidward, Squilliam, all of the band members show up and are stand by ready to play. They enter a glass dome and are lifted up into a realistic-looking football field to perform for a halftime show in front of live humans (though Squidward's band believes that they're mutant fish), making Squidward worry that he might embarrass himself in front of Squilliam and the humans. Fearing that he may never show his face in public again, Squidward worryingly gives the cue to start playing. Conversely, the band’s introduction is magnificent, and Squidward is surprised and feels proud of himself. He takes credit for their success when Squilliam appears next to the stage, who is watching the band in horror. The highly-choreographed band plays “Sweet Victory” with SpongeBob (singing voiced by David Glen Eisley) singing the lead. Below is the full list of results from Nickelodeon UK and Ireland's "SpongeBob's Top 100" programming stunt, where British and Irish fans of "SpongeBob SquarePants" and Nickelodeon UK and Ireland viewers voted for the UK and Eire's all time favourite episode of the hit original animated Nickelodeon show (Nicktoon) "SpongeBob SquarePants", from Nickelodeon UK's official websites official "Presenting The Top 100 Favourite SpongeBob Episodes As Voted By You! 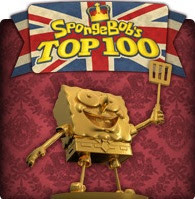 SpongeBob's Top 100 Results" webpage on Nick.co.uk's official "SpongeBob SquarePants" website. It's 'Top Of The SpongeBob Episodes'! 100 - Summer Job - Mrs. Puff has to work through her summer break at the Krusty Krab. 99. - One Course Meal - We find out that Plankton is afraid of whales. This is of course very interesting to Mr. Krabs, who just happens to know one quite well! 98. Driven to Tears - SpongeBob has failed his driving test again. Patrick is outraged, and takes the test himself. And passes. And wins a brand new car! SpongeBob finds it hard to be happy for his friend. 97. The Algae's Always Greener - Plankton has a new invention that allows him to switch lives with Mr. Krabs. But he soon finds out that a day in Mr Krabs' shoes is not exactly a picnic! 96. The Pink Purloiner - SpongeBob's favourite jellyfishing net is missing! Worst of all, Patrick may have been the one that stole it - but can SpongeBob prove it and obtain a confession from his friend? 95. The Other Patty - Mr Krabs and Plankton discover a common enemy when a new 'Flabby Patty' restaurant opens up in town. 94. Oral Report - SpongeBob confronts his greatest fear - giving a speech in class! 93. Komputer Overload - Plankton is sick of Karen's criticism, so he decides he can just replace her with some new computer inventions! But it's not long before he learns that Karen truly is one of a kind. 92. The Patty Caper - It's time to restock the secret Krabby Patty ingredient, and it is SpongeBob's duty to make sure the ingredient is delivered safely. When it is stolen, SpongeBob must crack the case. 91. Plankton's Army - It is the 25th anniversary of Plankton's first attempt to steal the secret formula. The Krusty Krab crew is on its guard, so Plankton enlists the help of his many plankton relatives. 90. Plankton! - Plankton hides out in SpongeBob's head and takes control of his brain, so SpongeBob must fight his own body to prevent himself from handing over the secret Krabby Patty recipe to Plankton! 89. Missing Identity - SpongeBob has lost his name tag! He has no idea where it has gone. He retraces all of his steps, but to no avail. It's the most terrible thing that has ever happened! 88. Krabby Land - It's summer break, and Mr. Krabs wants to squeeze every penny out of the children who are on their school holidays. So he turns a pile of rusty old junk into the happiest place on earth. 87 - Enemy in Law - When his mother starts dating again, Mr Krabs is unimpressed with her choice of paramour - Plankton! Convinced that it must be a trick, he tries to break up the romance. 86 - Mid Life Crustation - Mr. Krabs is feeling old, so to get hip again he joins SpongeBob and Patrick on a night out. 85. Mrs Puff You're Fired - Word of SpongeBob's record of failed boating tests has traveled to the top of the boating school industry. With such a huge blight on Mrs. Puff's teaching record, she is fired! 84. Krusty Love - Ms. Puff pays a visit to the Krusty Krab and Mr. Krabs is instantly smitten with her. He recruits SpongeBob to help him woo Ms. Puff. SpongeBob inexpertly tries to play match maker. 83. New Digs - After arriving one minute late for work, SpongeBob decides to move into the Krusty Krab so that he will never be late to work again. 82. As Seen on TV - SpongeBob is recognised by a member of the public after appearing on a cheap cable channel at 3 o'clock in the morning. It goes to his head, and he decides to leave the Krusty Krab! 81. Welcome to the Chum Bucket - Mr. Krabs loses SpongeBob in a bet with Plankton, so SpongeBob is forced to go work at the Chum Bucket. But SpongeBob turns out to be a less than ideal employee! 80. I Had An Accident - SpongeBob, while sand sledding, breaks his bottom. Paranoid, he becomes a hermit and cloisters himself in his house. Sandy and Patrick do all they can to try and get him to come out. 79. Rodeo Daze - SpongeBob takes his pals to Texas to see Sandy in a squirrel rodeo. 78. Sailor Mouth - SpongeBob and Patrick discover a bad word. They don't know what it means, but they use it as much as possible, which doesn't impress Mr Krabs at all. 77. Imitation Krabs - Plankton schemes to steal the Krabby Patty by disguising himself as Mr. Krabs. SpongeBob gets given conflicting orders all day long, sending him crazy trying to please them both! 76. Spongicus - Plankton has demolished the Chum Bucket! In its place, he has built a Roman coliseum and announces there will be a gladiator show, which means togas, chariots, and ferocious lionfish. 74. Nasty Patty - A passing stranger falls asleep in the restaurant. Mr. Krabs and SpongeBob become convinced that he is the health inspector and that they have killed him with a spoiled Krabby Patty. 73. Karate Island - SpongeBob receives an invitation to take part in a competition on mysterious Karate Island for the chance to be crowned "King of Karate." 72. The New Leaf - In the battle for fast food supremacy, Plankton has decided to throw in the towel and start a new business selling trinkets and souvenir gifts. Mr Krabs is convinced it's another scheme. 71. Squid's Day Off - Mr. Krabs takes the day off and puts Squidward in charge. Squidward takes the day off too, leaving SpongeBob in charge. But Squidward can only imagine the disasters that might happen! 70. Something Smells - SpongeBob eats some sea onion ice cream and his breath stinks. When people avoid him, SpongeBob thinks that it's because he's ugly, so finds various ways to hide his hideous face. 69. Help Wanted (the very first episode of "SpongeBob SquarePants"!) - Encouraged by his best friend, Patrick Starfish, SpongeBob applies for his dream job as a fry cook at the Krusty Krab, and is challenged to prove himself worthy of the job. 68. The Secret Box - Patrick has a box and he won't show SpongeBob what's inside of it because it's a secret. SpongeBob can't believe Patrick would keep something from him, and it drives him crazy. 67. Hocus Pocus - SpongeBob tries to impress Squidward with his new magic kit. Squidward sneaks away without SpongeBob noticing - making him think that he has turned his neighbour into an ice cream cone! 66. Patrick SmartPants - During a day of jelly fishing, Patrick gets bonked on the head and loses consciousness. When he comes to, he's suddenly speaking in complete sentences - and even making sense! 65. Someone's in the Kitchen with Sandy - Plankton steals Sandy’s fur to disguise himself as Sandy and get the Krabby Patty formula. 64. Krabs Vs Plankton - When Plankton slips and falls on some water at the Krusty Krab, he sues Mr Krabs for failing to post a wet floor sign. Only one man can defend Mr Krabs - SpongeBob LawyerPants! 63. Plankton's Regular - A new customer at the Chum Bucket brings competition to the Krusty Krab, as Plankton finds his very first diner that actually likes the food, and keeps coming back! 62. Chum Caverns - Plankton creates an underground restaurant that threatens to put the Krusty Krab out of business. 61. Dear Vikings - SpongeBob is determined to find out everything there is to know about Vikings. So he writes them a letter, and they pay a visit to the Krusty Krab to answer his questions in person! 60. Gramma's Secret Recipe - Plankton disguises himself as SpongeBob’s grandmother. 59. The Perfect Chemistry - Sandy and Plankton bond over their shared love of science. 58. Blackened Sponge - SpongeBob gets a black eye when a toothpaste malfunction causes him to punch himself in the face. But his wild explanations for the shiner soon attract some unwanted attention. 57. Chum Bucket Supreme - Plankton hires Patrick to create advertising slogans for the Chum Bucket. And who better to remind us all that Chum is... Fum? 56. Big Pink Loser - Patrick feels like he hasn't accomplished anything with his life and he decides to take SpongeBob on as his role model. At first, SpongeBob is flattered, but it soon goes too far. 55. Dying for Pie - When Squidward accidentally lets SpongeBob eat an exploding pie, he feels guilty and resolves to make SpongeBob's few remaining hours left in the world enjoyable. 54. To SquarePants Or Not To SquarePants - When SpongeBob goes to the store to buy some more, he finds that the store is all out of square pants! So SpongeBob decides to try a new look - round pants! 53. Squid Wood - SpongeBob builds a dummy modelled on his favourite neighbour. At first Squidward is pleased, but eventually everyone wants to spend time with the dummy, preferring it to the real Squidward! 52. Doing Time - SpongeBob is driving crazily during one of his driving tests with Ms. Puff. She takes the blame and goes to prison. SpongeBob feels so guilty that he tries to help by breaking her out. 51. Whale of a Birthday - Mr. Krabs wants to give his daughter Pearl the best birthday ever - but cheaply. While he works on the party, SpongeBob must find out what Pearl would like for a present. 50. SquidBob TentaclePants - Sandy's experimental teleportation device malfunctions, melding SpongeBob and Squidward into one body! 49. Mermaid Man and Barnacle Boy VI - The Motion Picture: SpongeBob is unimpressed when an incompetent director destroys the big-screen movie version of his favourite cartoon. So he makes his own version. 48. Mermaid Man vs SpongeBob - Plankton has brainwashed Mermaid Man and Barnacle Boy! With the dynamic duo under Plankton's control, he orders them to wreak havoc on the Krusty Krab. 47. Squidtastic Voyage - When Squidward swallows his clarinet reed, Sandy offers to retrieve the piece by shrinking herself and a mini sub down to microscopic proportions and traveling into Squid's body. 46. Prehibernation Week - Sandy is going into hibernation soon and she wants to pack a million activities for her and SpongeBob to do together in a week. SpongeBob is game, but he can't keep up with Sandy! 45. Not Normal - When Squidward points out to SpongeBob that he's not normal, SpongeBob makes it his mission to become normal. Could this be the end of the SpongeBob that we know and love? 44. You Don't Know Sponge - SpongeBob and Patrick take a friendship test. 43. Wormy - Sandy goes out of town, putting SpongeBob and Patrick in charge of her caterpillar. When the caterpillar turns into a butterfly, they think that it ate the caterpillar, and will eat them too! 42. My Pretty Seahorse - SpongeBob finds a stray sea horse and adopts it. When it comes time to go to work, SpongeBob can't bear to leave him at home so he takes him to work and hides him in the kitchen! 41. Rock Bottom - SpongeBob accidentally gets on the wrong bus, and finds himself lost in an unfamiliar and mysterious part of the sea called Rock Bottom. Can he figure out just how he can get back home? 40. Dumped - Gary starts following Patrick around and SpongeBob can't figure out why. At first, it doesn't bother him, but slowly he grows more and more jealous and becomes determined to win Gary back. 39. Gary Takes a Bath - It's time to give Gary a bath, but he doesn't want to take one. SpongeBob tries to lure Gary into the tub but he refuses to go. In the end, Gary outsmarts SpongeBob. 38. Neptune's Spatula - On a visit to the Fry Cook Hall of Fame, SpongeBob inadvertently pulls a mythical spatula from a vat of ancient grease, giving him claim to the title of Worlds Greatest Fry Cook! 37. Krabby Road - Plankton forms a rock band with SpongeBob, Patrick, and Squidward, planning to get SpongeBob to write a song about the secret Krabby Patty ingredients. What could go wrong? 36. Texas - Sandy Squirrel comes down with a case of the blues and SpongeBob is determined to find out why and what he can do about it. It turns out Sandy is homesick for Texas, and plans to go back there. 35. Fear of Krabby Patty - When SpongeBob develops a baffling fear of Krabby Patties, only the expert advice of "Dr. Peter Lankton" can help - or can it? 34. Suds - SpongeBob comes down with an illness which turns him into a sniffly, sneezing, bubble-maker. But a very sensible visit to the doctor's office sounds like a very bad idea to Patrick. 33. Sandy's Rocket - Sandy Cheeks plans on taking a rocket ship into outer space. Sneaking in for a look, SpongeBob and Patrick accidentally launch it, and think that they have landed on the moon! 32. The Card - SpongeBob just can't get the new super-rare talking Mermaid Man and Barnacle Boy trading card! Patrick gets one straight away - but doesn't treat it with the appropriate respect. 31. Snowball Effect - When it snows in Bikini Bottom, SpongeBob and Patrick play outside. When Squidward makes fun of them, it turns into the biggest snowball fight anyone has ever seen! 30. Breath of Fresh Squid - After zapping himself with his own own security fence, Squidward's personality gets scrambled, and he becomes the nicest squid you ever did meet - which is very annoying! 29. Karate Choppers - SpongeBob and Sandy's constant karate sparring is causing chaos in the Krusty Krab. So Mr. Krabs orders SpongeBob to cease all karate activities - but can he resist? 28. Legends Of Bikini Bottom - Part 3: Trenchbilies - SpongeBob and Patrick fall into a cavern where frightful Trenchbillies keep them hostage. 27. No Weenies Allowed - SpongeBob and Sandy discover the Salty Spitoon, a rough hangout for rugged folk. Sandy makes it past the bouncer, but SpongeBob has to prove that he's tough enough to get in. 26. Giant Squidward - Squidward gets sprayed with plant growth spray, and becomes huge. SpongeBob and Patrick are thrilled, but the citizens of Bikini Bottom are terrified of the monster, and want him out! 25. The Gift of Gum - It's Best Friends Day! SpongeBob gives Patrick a robot. Patrick gives SpongeBob some used chewing gum, which is of course the best thing ever. And not at all creepy. So it has to go! 24. Squirrel Jokes - SpongeBob becomes an overnight stand up comedy sensation when he starts telling jokes about squirrels. At first, Sandy is a good sport about it, but soon her feelings are hurt. 23. The Tunnel of Glove - Pearl is embarrassed when she must sit next to SpongeBob in the Tunnel of Glove. 22. The Camping Episode - SpongeBob and Patrick decide to go camping - in the back yard. Squidward tells them to be quiet, but takes their innocent "have fun inside the house" comment as a challenge! 21. The Slumber Party - Pearl's getting ready for her slumber party, but Mr. Krabs' meddling results in him being banned from the house. So Mr Krabs sends his number one employee to be his undercover spy! 20. Krusty Krushers - Mr. Krabs is entering the world of professional wrestling - but he's not going to wrestle. He's going to manage the newest tag-team wrestlers in Bikini Bottom: SpongeBob and Patrick! 19. Squidward in Clarinetland - Squidward and SpongeBob have to share a locker. 18. House Fancy - Squidward's house is to be featured on a TV show about fancy houses - but he soon realises that his place is not exactly camera-ready, and that he might need SpongeBob's help. 17. Model Sponge - SpongeBob tries a career at being a model in a kitchen sponge commercial. 16. Bubblestand - SpongeBob introduces Patrick and Squidward to his unique talent, the art of bubble blowing. Squidward accepts the challenge and attempts to surpass SpongeBob's level of expertise. 14. Sandcastles in the Sand - A friendly day of building sand castles soon turns into all out war when SpongeBob and Patrick use their sand creations to battle each other. 13. Gary In Love - Love is in the air, when Gary falls for a snail named Mary. 12. I Was a Teenage Gary - Squidward agrees to take care of SpongeBob's pet snail Gary while SpongeBob is out of town. When Squidward's negligence causes Gary to become ill, SpongeBob gets turned into a snail. 11. The Fry Cook Games - Mr Krabs enters SpongeBob in the Fry Cook Games. Patrick wants to join in, but he's not a fry cook. So he gets a job at The Chum Bucket - and the competition is on! 10. Rock-A-Bye Bivalve - SpongeBob and Patrick find an abandoned baby clam and decide to rear the child as their own. SpongeBob takes on the role of mother, while Patrick becomes the father. 9. MuscleBob BuffPants - SpongeBob finds Sandy Squirrel's rigorous physical training too tough and chooses the easy way out by ordering a pair of fake "bulky arms" as seen on TV. 8. 20,000 Patties Under the Sea - SpongeBob and Mr. Krabs turn an old submarine into a mobile Krusty Krab. Plankton responds with his own travelling Chum Bucket., and soon there's an epic battle going on. 7. Big Sister Sam - Patrick's big sister Samantha comes for a visit. 6. Toy Store of Doom - A new toy store opens, but when SpongeBob and Patrick get locked inside when it closes, they discover that things are a lot different at the toy store when no one's around. 5. That's No Lady - When Patrick mistakenly thinks he has to get out of town, SpongeBob helps to disguise his friend - so Patrick becomes Patricia, the prettiest new waitress at the Krusty Krab. 4. Best Day Ever - SpongeBob is going to have the best day ever, but it doesn't go exactly as planned when each of his friends has a problem which SpongeBob naturally sets out to solve. 3. F.U.N - SpongeBob thinks that Plankton is so evil because he's just lonely. After the two become friends, they engage in lots of friendship activities - but will Plankton give up his dastardly ways? 2. Idiot Box - When SpongeBob and Patrick get a new TV, they throw it out and keep the box. Squidward gets to keep the TV, but can't help but be distracted by the fun SpongeBob and Patrick are having. How did your all-time favourite episode of "SpongeBob SquarePants" rank in "SpongeBob's Top 100"? You can watch short streaming video clips from each of the winning "SpongeBob SquarePants" episodes here on the official Nickelodeon UK websites' official "SpongeBob's Top 100 Results" webpage. You can also relive the best bits of "SpongeBob's Top 100" in Nickelodeon UK's "The Best Of SpongeBob's Top 100" which Nickelodeon UK will be showing on Saturday 9th June 2012 and Sunday 10th June 2012 between 1pm and 4pm (repeated from 2pm to 5pm on Nick Replay UK). Nickelodeon UK revealed the results of Nick UK's "SpongeBob's Top 100" programming stunt between Monday 4th June 2012 and Friday 8th June 2012 to celebrate Queen Elizabeth II's Diamond Jubilee and the June 2012 half term school holiday, where each episode was introduced her Her Majesty The Queen. "SpongeBob's Top 100" also featured Nickelodeon Stars such as Brad Kavanagh, who portrays the 'House of Anubis' character 'Fabian Rutter', who told Nickelodeon viewers their favourite "SpongeBob SquarePants" episodes. You can view a high quality (HQ) high definition (HD) streaming video and transcript of one of Nickelodeon UK's "SpongeBob's Top 100" promos here on NickALive!.